Wisdom Science: Which Zodiac Sign Is Your Worst Enemy? 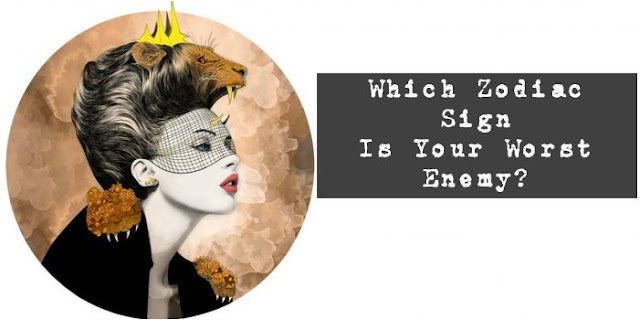 Ever wondered which astrological sign is your worst enemy? Is it the uptight Virgo or the selfish Aries? Let’s find out! We can’t get along with everyone, and most of us have that one person in our lives that makes our blood boil. We hate them above everyone else because we’re either the same, too different or just straight up think they’re a jerk. Having a nemesis makes life interesting, especially when you’re finding out that they’re going to hold that title for you. A souring relationship can also be taxing, so let’s save you the trouble of finding out for yourself. This zodiac sign is your mortal enemy. Which sign rubs you the wrong way? Tell us in the comment section. Aries. Not much gets under your skin. You’re a pretty laid back person and float through life unbothered. However, the one thing that pisses you off is aggressive, mean people. The passion and abrasiveness of an Aries is the only thing that makes you want to fight. Pisces. What is Pisces even thinking? You have no understanding of them and see their dreaminess and idealism as a weakness. They never get anything done and you think they’re totally useless. Leo. Don’t they know that you’re always right? They’re so square and alpha, you just can’t hang. You hate the fact that they always try to be in charge and think they’re totally overrated. You think you’re superior to them, but the issue is really that you’re too similar. Aquarius. They are your frenemy. On paper, you two should be friends. But you can’t stand a bias opinion or someone who can be so cold. You want to be praised, and an Aquarius will never do that for you. You’ll keep trying to win them over while secretly loathing them anyway. Libra. You always feel like they’re hiding something. They have this sunshiney outside and it confuses you. If they have any depth, you’re very suspicious of whether or not it’s good. You hate dishonest and fake people, and you set out to make them suffer. Cancer. They are totally reckless and it freaks you out. They obviously follow their heart and not their mind, which you think is stupid. You hate any mess you can’t clean up, and Cancers are just beyond your realm. That’s a hot mess you can’t even touch. Taurus. You can’t understand how anyone is so boring and lazy. A Taurus is just the opposite of everything you value. If they don’t excite you, you want nothing to do with them at all. You see them as a roadblock that you want to plow over. Virgo. This power struggle is never destined to end well. You want blind followers, while a Virgo wants everything to be perfect. They question you way too much, and that makes you absolutely despise them. Sagittarius. They’re your disloyal ex. You were so devoted to them and they could have given or taken you. Basically, a Sagittarius is destined to hurt a Cancer’s feelings, which makes them enemies for life. Cancer will never get over it, but a Sag moves on quickly, so this hatred is one sided. Capricorn. You talk too much, and Capricorn is never trying to hear it. You can’t stand headstrong people who think they know it all. You aren’t trying to hear it, because you’re completely bored and annoyed by them. Gemini. You can’t stand how flaky they are. You’re totally thrown off by their indecisiveness and they make you completely flustered. They’re unpredictable, which makes them seem terrifying to you. You try to shut them down as much as possible to keep them far away. Scorpio. You hate anyone who can’t be straight forward. You don’t like pushback, especially if it’s not direct. You’re both aggressive, but in totally different ways. You don’t understand them, so it makes you furious.